Vinsofts JSC started back in 2009 when a group of engineers who graduated from leading technology universities, Hanoi and Ho Chi Minh University of Science & Technology, founded M-Era Co. The main office of M-Era was located in Ho Chi Minh city, Vietnam and the company had the aim to serve foreign customers who wanted to develop website and mobile applications. At that time, the smartphone technology led by Apple and Google began to flourish, which encouraged the founder team to participate in Google’s coding camp, resulting in the team winning the award. In 2011, the company’s founders decided to move M-Era Co from Ho Chi Minh city to Hanoi, where the company operated for 2 more years. The 4th of July 2013, M-Era Co was renamed to VIN Trading and Services Ltd., which focused on outsourcing, software development, E-commerce solutions, etc. In the following years, VIN Trading and Services Ltd. doubles its workforce, reaching up to 30 employees. On the 14th of July, following the success of VIN Trading & Services Company Ltd., the founders decided to establish a new professional image and growth strategy, thus renaming the business to Vinsofts JSC. Vinsofts JSC’s core business fields were established: Website and mobile app development, blockchain technology, E-commerce & ERP solutions and Software & IT services. The company continued growing steadily and reached 45+ employees by the end of that year. Vinsofts commemorated its 5th year of creation along with its young and energetic workforce that has become a growing feature in their success. 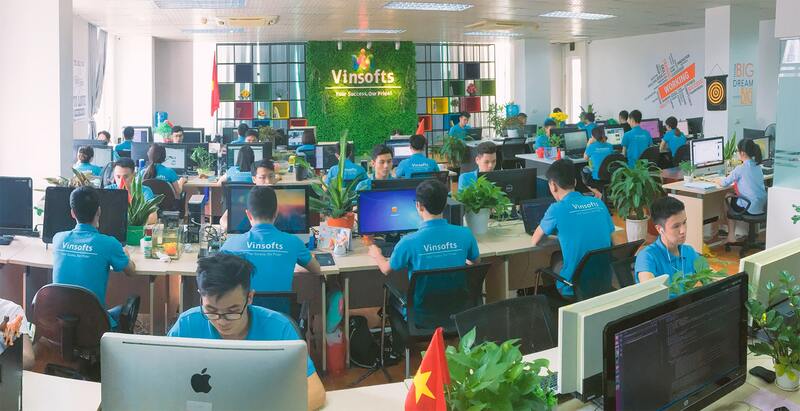 2018 was a year of changes for Vinsofts, as it established its new HR and Corporate strategy, in which the company seeks to become one of the biggest technology firms in Vietnam and to create a solid space in the global market. Vinsofts JSC expanded its Leadership and Senior managers team to achieve the Go Big target in 2018-2020. The company renewed its brand image, creating a more identifiable and unique corporate presence. Vinsofts is looking forward to implementing an IPO in the period 2021-2023, for which the company is welcoming any cooperations and investment from organizations and individuals during 2018 – 2021.